Scott Sinfield, co-founder of the label Make Mine Music, has been recording under the name Portal since 1996. He has now decided to abandon that name, partly because of the associations that go with it. As he put it himself recently, it does have certain "Dungeons and Dragons" connotations. There are also a number of other acts using the same name. Whenever I search for Portal's music on sites such as Last.fm or Spotify, I am presented with a death metal band wearing scary masks. So it would certainly be less confusing if he started to use a different name. Within the blog, the tracks are sorted into a number of separate pages, representing the original Portal album and EP releases. If you don't have the time or inclination to listen to the entire archive, you can just download the tracks from an individual Portal album. Portal's music has encompassed several different styles over the last 13 years, but it is often referred to by the general category of "dreampop". Some releases have more electronic elements than others, but the constant factor is Scott's very precise musicianship. If I had to compare Portal to one act, it would probably be The Durutti Column. I can't say for certain if this is a conscious influence on Scott's playing, but I would guess that it is and that he would be flattered by the comparison. An early Portal track, "Celebration", has the subtitle "Vini" and I am assuming that this is a reference to Vini Reilly. Another more obscure reference point that I sometimes spot in Portal's music is the Nuneaton duo, Eyeless In Gaza. For anyone who is feeling slightly overwhelmed by the huge amount of music available in this archive, I would recommend the album "Reprise" as a good place to start. This was Scott's first collaboration with vocalist Rachel Hughes, and the combination of her voice with the luscious textures suggests something that would have been released on 4AD. I'm listening to this now as I type this article and the sound perfectly complements the snowy landscape I can see from my window. "Prehistory" is also worth checking out. 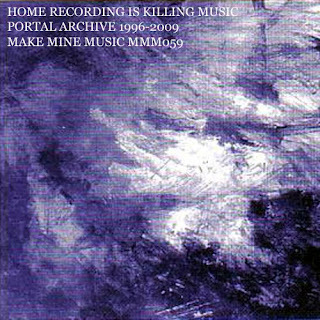 As the title suggests, it contains some of the earliest Portal recordings. Many of these are fairly simple in their structure, and less reliant on technology than some of the later tracks. The cover of Simon and Garfunkel's "Homeward Bound", again featuring Rachel on vocals, is simply stunning. By way of contrast, the final release, the "Options" EP, is Scott's attempt at a classic synthpop sound. It could easily be a New Order release from the mid-80s, and is one of my favourite singles from the past year. It features guest vocals from Glen Johnson, a name that should be familiar to regular readers of these pages. These are just a few of my choices from Portal's back catalogue; I would recommend anyone with a bit of time to kill over the Christmas break to download as much of the archive as you can, and also please pass on the link to anyone who might not have read this post. Although Portal is no more, Scott has promised to return in the new year under a different name. I'm not sure whether this new music will continue in the same vein as "Options", or if we will be treated to something entirely different. But whatever Scott has in mind for this new project, I'm sure it will be worth the wait. Many thanks for your kind words. You're correct about the number of tracks, by the way. I wrote the introduction whilst I was still compiling the archive, and although some tracks were left out as I went along, I forgot to account for these. I've now amended the blog, but will endeavour to add more tracks, possibly from live recordings, to top up to the full 100, in the next few days.